They put the steering wheel on the wrong side! Still don't like the front, need to blacken out the chrome and put some carbon wrap in the middle. Same on Redbook. The fuel economy figures are still the same though, however I do believe the new transmission is meant to be a little more efficient. It could be the figures are yet to be updated. I was checking out the update on their website and now if you want the 2.4lt engine you have no choice but to get the GSR sportback model, the 2 cheaper sedans only have the 2lt. It does appear you now get CC air standard along with DAB radio. I would rather have seen the Taiwanese Lancer FORTIS introduced here in Australia. Our Aust model looks so Bland & Lackless compared to overseas models. I believe the mirrors are the same. 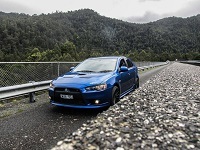 Don't be surprised if Mitsubishi Australia decide to change the Lancer to that design next year or two. It was clearly done for the US market. I just wish they would stop mucking about and just make an all new Lancer, love my CJ but it can't go one forever. SAM-24A wrote: I would rather have seen the Taiwanese Lancer FORTIS introduced here in Australia. Our Aust model looks so Bland & Lackless compared to overseas models. But seriously cant beat the original styling, remember my RA getting looks & compliments on the styling back when they came out. 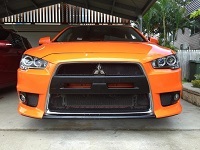 Time for Mitsu to stop rehashing this design as its going against them & give us something more bold & innovative. And it's not just looks, Hyundai and others are now selling car with smart cruise control including the ability for the car to steer it's self and stay within the lane, slow with other traffic and do emergency stops all by it's self. Not to mention new engine tech with hybrids and alternate fuels. Not sure is Mitsubishi is working on similar tech for it's cars/suv's, yes they are generally more expensive than the CJ but it wasn't too long ago this tech was only in top Euro cars costing 10 times the average Lancer price. 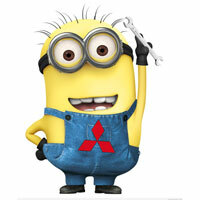 Mitsubishi needs an all now Lancer to get back on terms with Mazda, Toyota and now Hyundai and not be left behind.